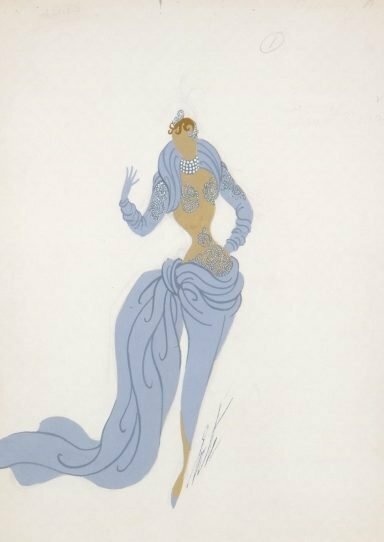 Romain de Tirtoff was Russian born, but named himself after the French pronunciation of his initials - Erte - this name soon became one of the most highly respected in the French fashion and theatre industries during the twentieth century. He produced his first successful design when he was only six years of age and in 1912 he went to Paris where he worked with the fashion publication Harper's Bazaar, creating fashion drawings and cover designs. It was here that his artistic career flourished. 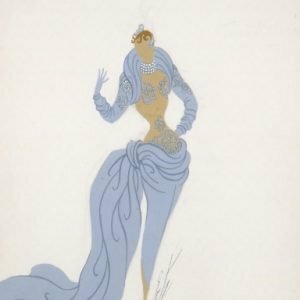 The gloriously extravagant costumes he created for shows at the Folies-Bergere and his taste for the exotic and the romantic captured the attention of a wide audience and his inventive and colourful designs became hugely popular. Due to the ever expanding market for Erte's work, he began to create a series of colourful lithographs of luxurious illustrations to meet demands. These pieces, however, are originals and are particularly fine examples of his appreciation for the sinuous qualities of the female figure and his flair for creating stylish, elegant and luxurious fashions.